Workshops, books, recordings, and other Buddhist resources for the Mendocino coast of northern California. An abbot from Abhayagiri Buddhist Monastery will guide meditation, teach, and answer questions. This is a wonderful opportunity for both longtime practitioners and beginners. Please see Weekly Events below for more information on the schedule of visiting teachers. All are welcome to attend when they can to enjoy mindful practices together. Mindfulness meditation techniques beneficial to beginners as well as longtime meditators will be taught and practiced. Mindfulness develops the faculty of being awake to the present moment, a valuable skill in our everyday lives. Its practices foster sharper concentration and deeper enjoyment of sensory experience. There is a world of difference being awake to the present moment and not. These sessions are offered freely, though donations to maintain the Hall are always appreciated. Cushions, blankets, stools, and chairs are provided. On the third Monday every month through the year until next year's Winter Retreat, a teaching monk or other designated teacher from Abhayagiri will lead our gathering. S/he will guide meditation, give a talk, and answer questions. As usual, these special opportunities are open to all, regardless of experience with Buddhism. Open to all: experienced, beginners, those with beginner's mind, those with religion, those without, those unsure. Each session begins with guided meditation. Next we consider a brief teaching, with an opportunity to have questions answered as well as to share how we can experience and apply the teaching in our everyday lives. As always, there is no charge, though freewill donations are accepted for use of the Hall. The leader, Cindy Mettika Hoffman, was ordained as a lay minister in the Thai Forest Tradition of Buddhism at Abhayagiri Monastery. She was also given authorization to teach meditation by Spirit Rock Meditation Center. 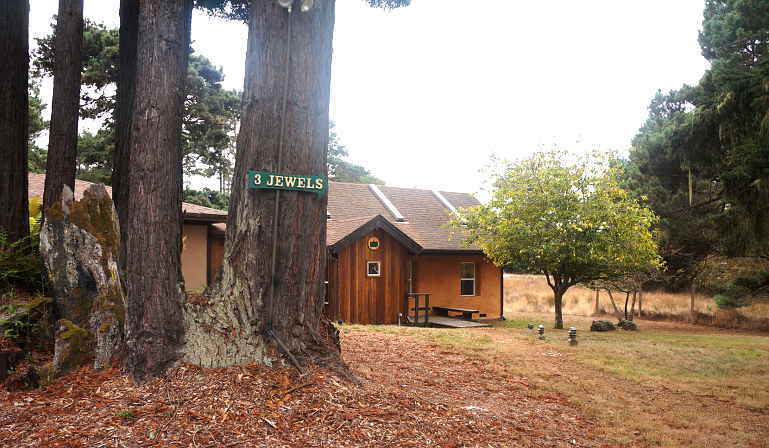 Three Jewels Dhamma Hall is just outside of Fort Bragg on the Mendocino coast of northern California. Three Jewels is dedicated to sharing Buddhist teachings in the Theravadan Thai Forest Tradition. The members of the Three Jewels group, or sangha, are mentored by Ajahns Karuṇadhammo and Ñāniko, abbots of Abhayagiri, a monastery in the lineage of Ajahn Chah. Abhayagiri is located in the mountains outside of Redwood Valley, about 50 miles inland from Fort Bragg. Three Jewels means Buddha, Dhamma, and Sangha. The word Buddha may refer to the historical Buddha who lived 2500 years ago, and it may also point to the wisdom that resides within each person. Dhamma means the teachings that the Buddha gave and can also mean things as they are right now. Sangha is the community of people who have practiced and internalized the teachings through the millennia. The core of the teachings is how to live without creating suffering in oneself and others. It is soothing, reinforcing, and helpful to have a group of people who practice together. The teachings are open to all and are offered freely. Gratitude is not exactly appreciation, which is a feeling of thankfulness, as it is a feeling of wanting to give back. Cultivating this active practice is a very important step in progress on the path. Although meditators may expect that meditation in itself will lead to happiness, it's more the reverse. Meditation is successful when one is happy, for a gladdened mind can concentrate. Focusing instead on negative states impedes meditation. The practice offers many opportunities to cultivate gratitude and positive states of mind. You can also listen to guided meditation and discussion from this session. 6/29/16: Layout of this page optimized for phone and tablet screens. 2/4/18: New format for Monday meetings.